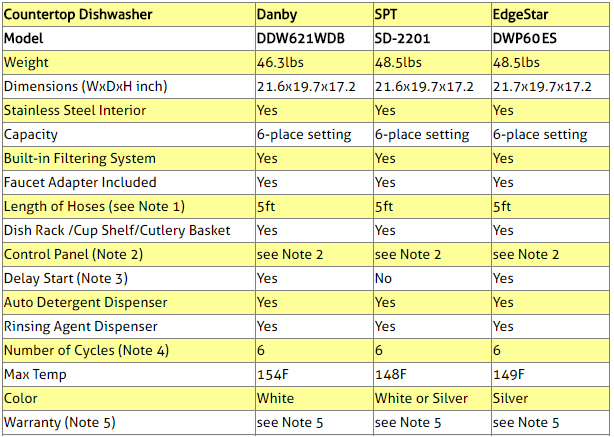 Compare Countertop Portable Dishwashers: Danby, SPT or EdgeStar? We all like to eat, and many of us love also to cook. But let's face it, most of us hate washing dishes. Fortunately, there is the dishwasher, best friend of any cook in the kitchen, and we don't have to worry about that chore. But what if you don't have a built-in dishwasher or not enough floor space in the kitchen for a dishwasher on wheels? Well, countertop and portable dishwashers, like the one shown in the picture, were conceived and designed to respond to such needs. Countertop dishwashers are usually about 17 inches tall and therefore fit neatly under most kitchen cupboards. They are smaller than built-in dishwashers and therefore do not need too much counter space. They also use less water and power when compared to standard dishwashers. They can be quickly connected to standard sink faucets using the faucet adapter that is usually provided, and they are equipped with inlet and drain hoses. Most brands usually have enough capacity for a 6-place setting and offer multiple wash cycles. 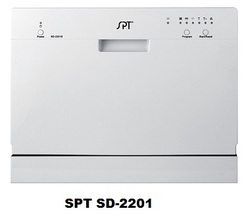 This article will compare the three of the most popular portable countertop dishwashers bought by Amazon customers. 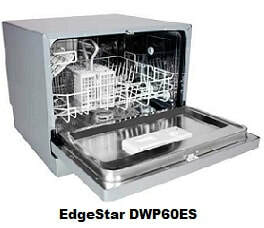 They are Danby DDW621WDB, SPT SD-2201 and EdgeStar DWP60ES. These three dishwashers were the top sellers in their category at the time this article was written and had received excellent reviews from Amazon customers. 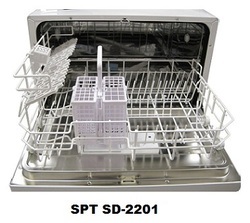 You will find below a point by point comparison of these dishwashers. Selected Countertop Dishwashers on Amazon. Two hoses are provided by all three dishwashers: an inlet hose and a drain hose. 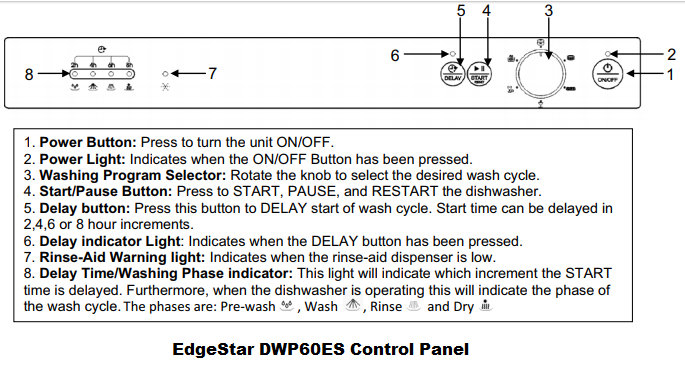 Delay start is a useful feature that allows you to start the actual washing after a programmable number of hours even if you are not around. 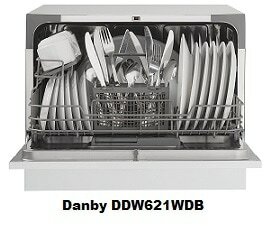 Danby: 1 year warranty on parts and labor. SPT: 1 year warranty on parts and labor. EdgeStar: 1 year on parts, 90 days on labor. For exact price information on the above compared portable dishwashers, please click the product image links in the Amazon section below. Note also that the Amazon price often includes a good discount on the list price. If a discount exists, both the list price and the Amazon price will be shown when you click the product image links in the Amazon section below. 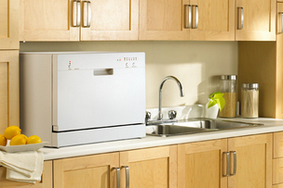 So which of the three countertop dishwashers is best for you? From the comparison table above, it is quite clear that the three dishwashers are quite similar with respect to a number of features: They all offer 6 wash cycles, they all have stainless steel interiors, their dimensions and weight are quite similar, they all provide 5 ft hoses and faucet adapters, they are all equipped with a dish rack, cup shelf and cutlery basket, their maximum temperatures are practically the same, and they all have a built-in filtering system. ​However, Danby and the EdgeStar come with the Delay Start feature. If that is something you are looking for in your dishwasher, you may want to consider one of these two dishwashers. This shows a very high degree of satisfaction by customers who have bought these dishwashers. 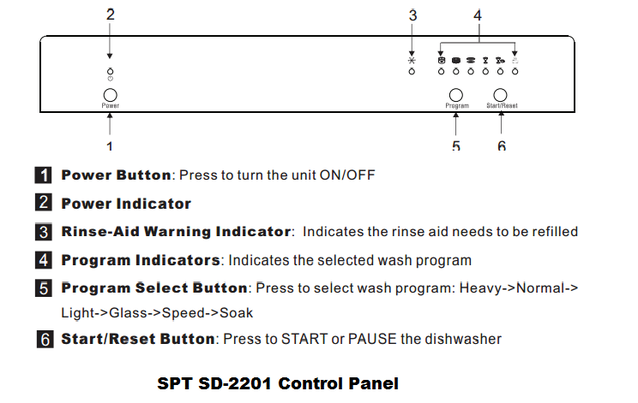 Given that, in order to choose the dishwasher that you will be most happy with, you may want to focus not just on the features offered but also on ergonomics, in particular by considering the control panels described above (in Table Note 2) and choosing the one that would appeal most to you in terms of ease of use and benefits provided. Color, style and price should also be considered before you make your final decision. 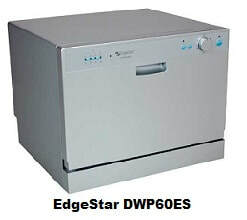 Please click the countertop dishwasher of your choice below for exact price information or to purchase.